Sterling Silver Scuba organized a wreck dive trip to Murrells Inlet, SC with Express Watersports dive operation. This was my first Atlantic Ocean wreck dive trip. We went to 4 dive sites and visited 5 wrecks during the weekend: the Hebe on Friday, 11 miles (tugboat and A-7 plane) on Saturday and USS Vermillion and City of Richmond on Sunday. I had 3 goals for the weekend: 1) get comfortable with my new gears in drysuit: a Dive-Rite dual bladder classic wing, a set of twin Faber LP 85 with a Dive-Rite manifold, a new Dive-Rite sidewinder safety reel; 2) complete my checkout dives for the TDI Advanced Nitrox certification; and 3) figure out my SAC rate. Day 1 - Friday Apr 18, 2 dives on the Hebe (0:34 @ 106ft; 0:26 @ 102ft, 65F). It took us two hours to get to the wreck, about 20 miles from shore. We had four divers sick on the boat... I buddied up with Kevin on my first dive and Rob joined us on the second one. There was a fair amount of silt and the visibility was fairly limited to about 20-25ft. There was so many fish over the wreck we couldn’t see it... as we reached the Hebe, we saw a large tiger shark about 10-12 ft long right in front of us. It was swimming slowly and made a quick turn as it got closer and continued its swim slowly away from us. This encounter was very impressive. I then practiced with my safety reel to avoid losing the anchor line. On the side of the wreck, we had another close encounter, suddenly facing a large manta ray, about 10-12 feet of wingspan and same for the tail. It was quite beautiful. We also saw 3 scorpion fish on this dive. On our second dive while waiting for Rob to join us, a large lumberjack turtle surprised Kevin by showing up a couple feet close to his head... It was pretty big, about 6 feet long and 3-4 feet high. On this dive we didn’t use my reel and lost the anchor line. As I got low on air, I called the dive and ascended straight above. I did my safety stop at 15 feet watching my air and depth gauge continually. I was preparing myself mentally to do a controlled emergency swimming ascend in case I would run out of air. I ended up about 100-150 yds from the boat with about 100 psi left in my tanks. With the surge, it was a rough swim back to the boat. I swallowed some water swimming on my way back to the boat and got very anxious as I ran almost out of air at the surface and couldn’t breathe easily from my regulator while swimming on my back hauling my twin cylinders... Once I made it to the boat, I had only 35 psi left in my tanks... I learned a good lesson and I hope that I will never get again into such a situation. If the surface surges are rough, make sure to reserve enough air to also swim to the boat in you case you need to. Day 2 - Saturday Apr 19, 2 dives at 11 miles (0:40 @ 48ft; 0:52 @ 45ft, 61F). It took about 45 minutes to get to the dive site. Again, we had a couple divers sick on the trip. I buddied up with Derek today, a good friend of Kevin who had not been diving for about 8 years and joined us for the day. Derek and Kevin inspected the condition of Derek’s gear the night before and he ended up using some of his drysuit, mask and fins, completed with Rob’s spare regulator, my spare SPG and computer, and Kevin’s jacket style BC. After his second dive, the neck seal of his drysuit broke... We had two great dive together. He’s a great diver, calm and in control. We practiced buoyancy and I made several air consumption measurements to calculate my SAC rate. At rest on the deco line, my SAC is about 0.45 cuft/min/ATA. While kicking against the current and working the reel, my consumption increased to about 0.6. On my first day, my average SAC was about 0.55 for the two dives at an average of 100ft deep, but there was a lot of new gear to get used to and multitasking. Based on this, I plan to use a SAC rate of 0.5 when planning my dives. I was on my own for the first two dives this morning as Kevin and Rob were teaching a wreck class. I tagged along the students on the first dive. 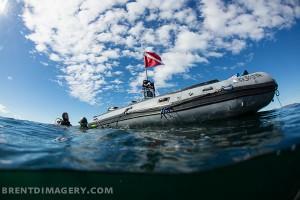 While they were practicing some skills at 90ft, I went down to check the entry on the side of the wreck at 115ft. Ony my way, I saw big tiger shark. This one was slightly smaller and farther than the one on the Hebe. I estimate it was about 8ft long and about 20ft away. Kevin found a shark tooth on the top of the wreck. On the second dive, to reduce my air consumption, I hovered on top of the wheel house at 90ft and practiced my buoyancy while students were practicing with their reel. I saw many large tunas, jacks and other marine life. On the City of Richmond, I dove with Kevin and Rob as they were done with teaching. The water felt very cold, although only a couple degrees colder only. The current was pretty strong when we reached the bottom. We did the entire wreck about 3 times. We found some ceramic tiles, shark eggs, a large and ugly rock fish, star fish and many urchins. Overall, it was a great weekend: gorgeous weather, 3 days of diving, 7 dives, made new frienships and I managed to meet my personal goals. Although I am comfortable with my new tech gears, I will still need many dives to do to master my buoyancy and improve my gear configuration. Next step, I’ll need to get travel and deco bottles and learn how to use those properly. You write the best dive secriptions. Always a pleasure becasue I can picture everything with the details. Thanks. Do you believe in GHOST on wreck dives ? ?